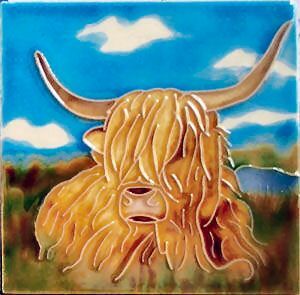 An individually hand painted ceramic picture tile with a fabulous painting of a Highland Cow. Increasingly seen in rare breed herds around the UK, the Highland Cow is a common sight around the west coast of Scotland and frequently stops the holiday traffic in search of the 'photo opportunity'. This coaster size tile is one of a matching set of tiles featuring animals from the Scottish Highlands, all found here in our webstore.